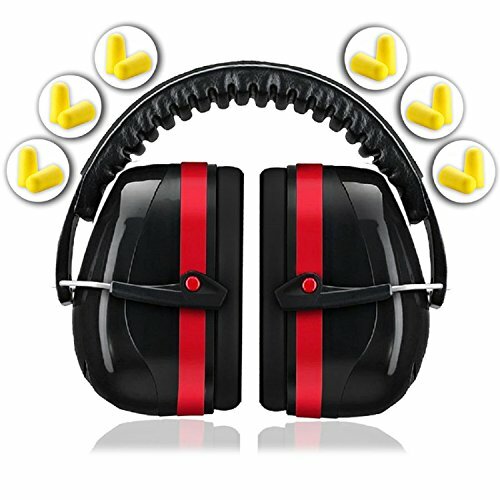 - If you work or play in a high noise environment, it is essential to protect your hearing form long term damage. Regular use of our hearing protectors will help protect your ears from long term damage. -Our earmuffs for shooting are rated SNR 32dB (NRR Rating), meaning they will absorb 100dB of hearing-damaging noise, and reduce it to 68dB. - To help protect your ears even more, we're including FREE BONUS 6 pair of Best Safety Ear Plugs. Made smooth for comfort, wear earplugs as additional protection, or wear alone when you don't need the full hearing protection of the earmuffs but still need a bit of sound blocking for comfort. - Our Shooting ear protection come with a comfortable padded headband, and muffs are held securely in order to provide the most protection possible. We have a no hassle 100% guarantee refund policy. If you use our EarMuffs Armor Noise Cancelling Headphones and do not love them, simply return for a full refund, even used. Add one to your cart today, and consider picking up another as a gift for a friend who would appreciate quality ear protection! EAR PROTECTION FOR SHOOTING with MAXIMUM Noise Protection- Enjoy Maximum Hearing Protection of upto 39DB NRR Rating by Wearing our Adjustable Noise Cancelling Ear Muffs together with our Best Ear Plugs. Wear alone or wear together for extra protection. BONUS - Includes 6 pair of Best Safety Ear Plugs to protect you even more from loud sound. Each has a smooth surface for greatest comfort and protection, made of non-allergenic and non-irritating material that will help protect your hearing even more. GUARANTEE - We have a no hassle 100% guarantee refund policy. Deals Rater are ONLY authorized seller. If you use our EarMuffs Armor Noise Cancelling Headphones and do not love them, simply return for a full refund, even used. Add one to your cart today! If you have any questions about this product by EarMuffs Armor, contact us by completing and submitting the form below. If you are looking for a specif part number, please include it with your message.